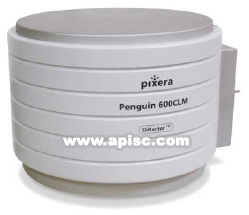 The Pengiun 600CLM represents a new and unique combination of very high resolution and very high sensitivity in monochrome for low light applications in microscopy.This is achieved by combining Pixera's high-resolution DiRactor® technology,extremely efficient cooling and sophisticated image processing technology. The "fanless" 4-stage thermoelectric Peltier cooling device reduces dark current noise by being attached to the fixed CCD's back plane.The heat is thes transferred away from the CCD's silicon to the external enclosure surface.No parts are moving,inclusive of the CCD,which is important in order to achieve the greatest cooling and image quality results.The cooling device is extremely fast with quite operation and achieves it's target temperature within 2 minutes of switching on the system. Other features include a high quality 1/2" B/W CCD,from SONY® with square pixels,long integration exposure,high dynamic range,high signal-to-noise ratio and a very easy to learn interface with simple yet powerfulcontrols. Unlike many other digital camera systems which increase the resolution using interpolation,the Pengiun 600CLM allows for a ture optical resolution of 5.8 million pixels using Pixera's proprietary DiRactor® light-swing opto-mechanical technology.The DiRactor® technology is achieving,publishing or digital zoom-in,the Pengiun 600CLM with up to 5.8 million pixels is your best choice. In addition to the camera system,Pixera's offer two practical accessories,hand switch Pengiun/Pro-HS(included) and foot switch Pengiun/Pro-FS for improved image capture control.See a quick description and pictures below of these two products and/or visit the product pages for each item on Pixera's web site.See also other options such as Pengiun/Pro-CS camera switch for use with two camers. The Pengiun/Pro-FS Foot Switch allows for hands free image capture while focusing your attentaion on microscope operation.Connects directly to Pengiun PCI card,with 10ft(3m) Cable.